Online Calcudoku Puzzles - Subscribe! 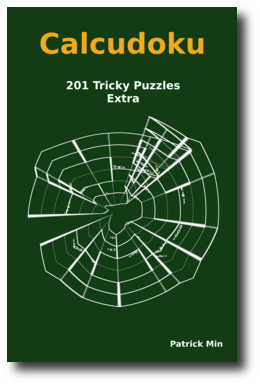 "201 Tricky Calcudoku Puzzles, Extra". 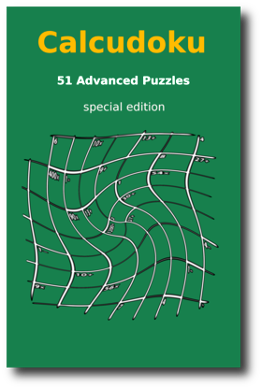 The 41 difficult puzzles in this book are worth 5 points each. 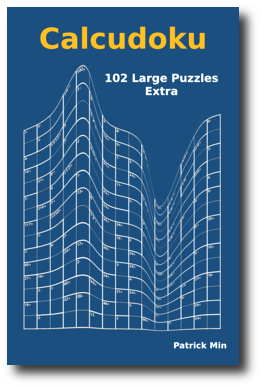 "102 Large Calcudoku Puzzles, Extra". 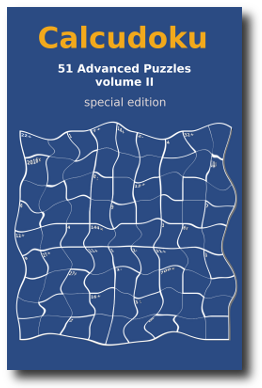 The 32 difficult puzzles in this book are worth 10 points each. 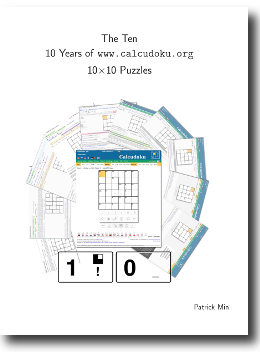 "The Ten 10 Years of www.calcudoku.org 10x10 Puzzles"
The 10 puzzles in this book are worth 10 points each. The six month subscription will get you one free book (of the first two, specify which one you prefer when ordering). Subscriptions are not automatically renewed (you can add a new subscription at any time). Payment is done through Paypal (where you can pay using a Paypal account or credit card; so note that no payment information is stored on this site). Note: after payment, wait until you return to the site, then your subscription will be started automatically. £1.75 Note: You have to be logged in before you can subscribe. £8.75 Note: You have to be logged in before you can subscribe. £13.95 Note: You have to be logged in before you can subscribe. It is also possible to become a subscriber by bank transfer to IBAN NL96INGB0006238302 (BIC/SWIFT code: INGBNL2A) to "Patrick Min Computer Programming", the Netherlands. Don't forget to put your username (!) in the transfer comments, and (for the 6 month subscription) the book you'd like. You can also support the site by giving a donation. This will be much appreciated, but is of course not required.